Get your child ready to read and write beyond grade level with JumpStart Academy Kindergarten. Our adherence to Common Core standards will include an in-depth focus on phonics. Each phonetic interactive lesson will be tailored to ensure that your child will become a strong reader and writer – and have fun while doing it! Users will become acquainted with the beginnings of forming complex words and sentences. The use of Common Core curriculum will also set them on their way to becoming strong readers and writers. 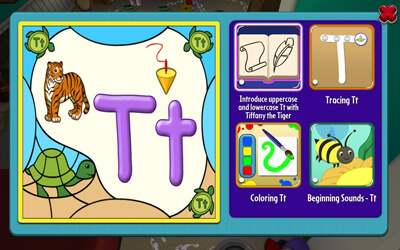 As your kid plays through JumpStart Academy Kindergarten, they will review all twenty-six letters of the alphabet and their sounds. They will also learn how to recognize sight words and be introduced to the basics of word building. Phonics will be covered through a series of games associated with a specific letter. For example, if the users is studying the letter “M,” they will play a series of games that will encourage learning about it. There may be a story about one of the JumpStart Phonics characters that is associated with the letter. So for “M,” the story will focus on Max Martian. Another game will focus on recognizing “M” by having players pick them out amongst other letters. Then, they will move on to tracing the capital and lowercase version of “M.” Finally, users will play a game focused on memorizing beginning sounds. To accomplish this, players will sort pictures with their corresponding first letter. For example, if there is a picture of the moon, they must sort it into the “M” category. JumpStart Academy Kindergarten is structured to prepare your child for the rigors of kindergarten and beyond. Our introduction to phonics will help players grasp the basics of spelling and reading that are essential to academic success. The games your kid will play will not only help them child fly through phonics, but it will make them eager readers in no time!